After looking through a bunch of Irving Penn Vogue photographs, I came across the cover below which reminded me of part of a painting I completed just before heading overseas in 2008. Here's a link to the painting My Ambassador. I guess I painted that image in the roundel for the fear of running out of cash half-way through the trip. It didn't happen, luckily and I even made a couple of sales overseas (don't tell my accountant)...and how am I going to fit in a crucifix? 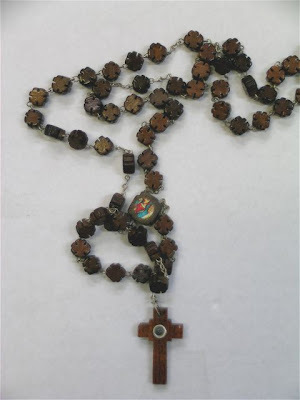 Well, below are rosary beads with a wooden crucifix that I bought from a Mexican Swap-meet in North Las Vegas, a large field with many small tents and stall selling their wares (similar to our A & P shows). When you look through the small metal ring on the crucifix (called a stanhope), an image of the Virgin of Guadeloupe appears. Just heard that Irving Penn passed away three days ago, aged 92. 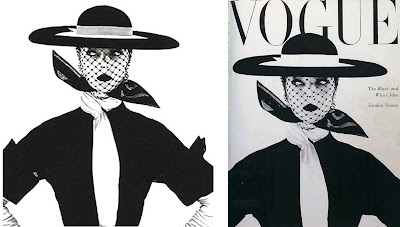 His famous Vogue cover image of 1950 (Below) taught me about the wonders of photographic fashion design cropping, having been familiar with the final cover, seeing the original photograph (left) showed how a subtle trim either side can change the whole feel of a photograph. 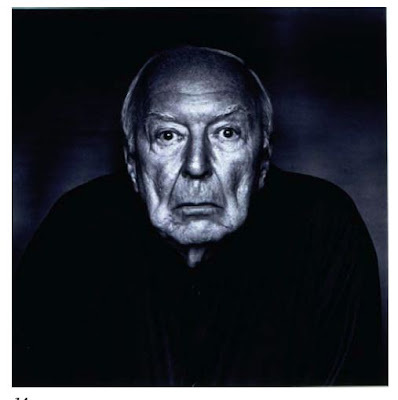 His portraits of Truman Capote are great too, but I couldn't pass up the fantastic Jasper Johns photo below. We unfortunately missed the Penn show at the Morgan Library in NYC by 3 months last year, would have been great to see, although, you can't be everywhere, all the time.